We are sharing the picture and it describe the history of rock cave in Munnar near Lock Heart Gap. Exactly we can say this cave is just opposite to Lock Heart View Point. Whole area is pretty scenic and breathtaking view of deep valleys and mountains. 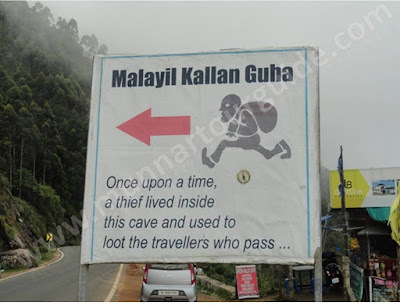 History:- As per the gathered information there was a thief who known as Malayil Kallan lived inside this cave and used to loot the travellers who pass though this direction. Seems interesting !!!!! One can enter inside the cave and we can notice that there is space for a person to stay inside. May be this cave was used by saints for their prayers and meditation in ancient period. Anyhow concerned authority or persons build concrete steps on the entrance and this help smooth passage into the cave.